For Venus flytraps, catching prey is as easy as one, two, three. Count on it with our study guide. We love this photo of Venus flytraps in their natural wetland habitat. The popularity of Venus flytraps “obscures their true scarcity,” according to the great Washington Post article. Where is the Venus flytrap’s tiny species range? Take a look at our short article for some help. Assistant Park Ranger A.J. Loomis explains: “It’s naturally growing here for one reason: The soil is so poor.” The flytrap digests insects to supplement the low amount of nitrogen and phosphorus it receives from the region’s sandy, acidic soil. Venus flytraps use “teeth,” triggers, and toxic juices to catch prey. The Washington Post article goes on to note that the Venus flytrap has an “unusually meaty diet.” How does a Venus flytrap catch its prey? Read through our short article for some help. The plant’s “trap” is a single, foldable leaf with trigger hairs. When a fly or ant brushes against one of the leaf’s trigger hairs two times, the plant folds its leaf quickly, trapping the prey inside. 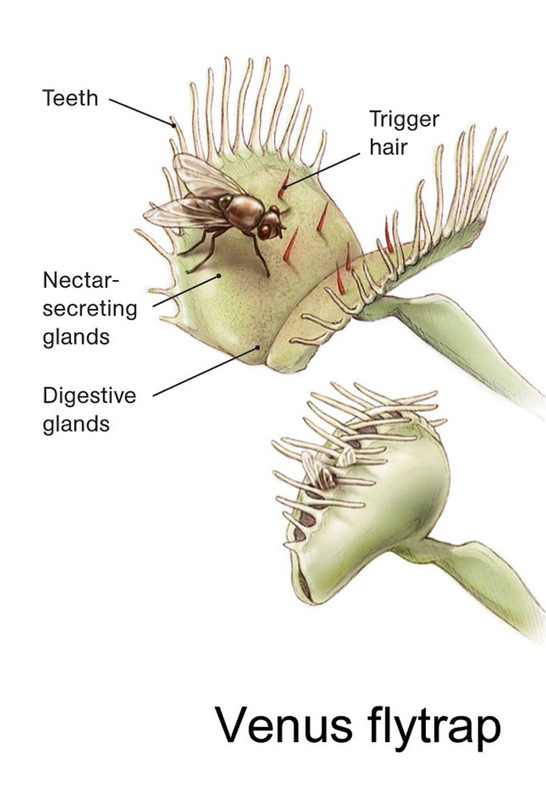 Then, the Venus flytrap secretes a digestive fluid that “liquifies the insect to nutrient mush.” It takes three to five days for the plant to digest the insect. Each leaf-trap can open and close about three times before dying and falling off the plant. 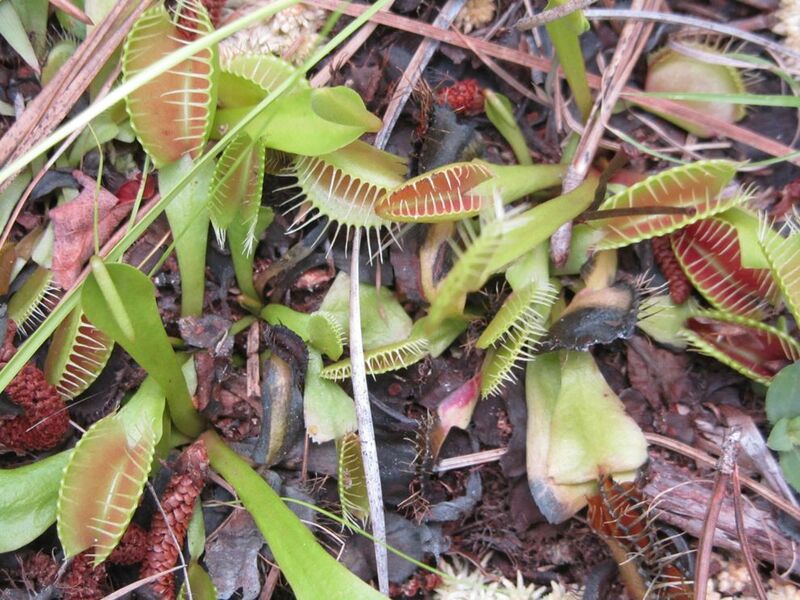 The old trap is replaced by a new one from the Venus flytrap’s underground stems. How are Venus flytraps pollinated? Like many plants, Venus flytraps have flowers. (Flytrap flowers bloom above the low-lying stems and leaf-traps.) Like many flowers, Venus flytraps rely on insects for pollination, a process called entomophily. Insects (often attracted by a plant’s color, patterns, odor, or nectar) collect pollen from the flower’s anther and distribute it to the stigma of another flower of the same species. This fertilizes the plant. Insects that pollinate Venus flytraps are sweat bees, long-horned beetles, and checkered beetles. How do the pollinating bees and beetles avoid being trapped by the flytrap’s deadly snapping leaf? Insects don’t avoid the trap, the trap generally avoids them. “That the identity of flytrap pollinators is mostly different from the identity of their prey is very interesting,” says one expert. The high-altitude business end of a Venus flytrap. The low-altitude business end of a Venus flytrap. Why do the prey and the pollinators of the Venus flytrap not overlap? How can the plant distinguish insects? color. “The color of the trap can vary from red to shades of green, while the flower is always white.” The pollinating insects may be attracted to white, while prey insects may be lured by red and green. Washington Post: Venus flytraps give insects that pollinate their flowers a break. They don’t eat them.